The production of flowering cabbage and kale has been increasing modestly in recent years. This is primarily due to a growing popularity with consumers, as well as to interest by the landscaping industry for products that can be used in late fall plantings. Retail garden centers, responding to this consumer demand, have added flowering cabbage and kale to their product mix to complement the traditional fall garden mum. Flowering cabbage and kale offer the consumer a plant which is both colorful and long-lasting in the landscape. While many of our flowering plants, including garden mums, lose their flowers and/or color after several frosts, flowering cabbage and kale will intensify in color and last up until the first December snowfall in our region. The successful sale of these plants is very dependent on the production of high quality plants. A crop of optimum quality should be short and compact with good head diameter size and the plants must have strong coloration. Usually this crop is produced in 6 to 8" azalea pots, but it may also be grown in 4" pots, hanging baskets, and multiple plant "tubs". It takes about 2.5 to 3 months to produce the crop from sowing to the coloring period when marketing begins. Plants are normally marketed in New England beginning in mid-September. High quality plants result from the selection of the correct cultivar for pot culture and following good cultural techniques. Plant breeders have been active in developing new cultivars of Brassica oleracea which have good growth habits and strong foliar coloration. The "flower" of ornamental cabbage and kale consists of the central leaves of the plant. These leaves will lose chlorophyll after several days of night temperatures below 50º F to reveal the coloration which ranges from white to pink to red. It will take 2 to 4 weeks to develop intense coloration from the start of cool night temperatures. Flowering cabbage and kale are divided into groups based on the shape of the leaf. Cultivars with smooth leaf margins constitute the flowering cabbage group while those with divided or "fringed" leaf margins are considered flowering kale. Within the kale group there are two types: the most common are the "fringed leaved cultivars" which have finely ruffled leaf margins and a smaller number which are called "feather leaved cultivars" have leaves that are finely serrated and deeply notched. Table 1 provides a listing of the common cultivars. Cultivar selection will depend on growth habit and coloration. Within each series there is normally a white, pink, and red cultivar. zAll cultivars listed here were developed by Sakata Seed America or Takii America. These are primarily breeding companies; seed is available through wholesale seed distributors. It takes about 11 weeks to produce a marketable product in a 6 to 8" pot so the seed must be sown in June for September sales. Germination will take 4-6 days at 65F-70F in the light. Lower temperature to 60F-65F after emergence. The later the seed is sown, the smaller will be the head at the time of sale. If seedlings are grown in plug trays do not hold them too long before transplanting. Restriction of root growth will prevent later plant development to marketing size. The seedlings can be transplanted to 806 or 1204 paks or directly to the final container. If the seedlings are too tall they may be planted deeply (up to the first leaves) in the final container. This will help to prevent the plant from toppling over if stem elongation occurs. The crop is best grown in a soil base mix (20 to 30% field soil) or addition of samn to prevent toppled plants, or a soilless media with good water holding capacity. The crop should be grown outdoors under natural conditions as greenhouse temperatures in New England are difficult to control in July and August. The plants respond best to cool (55º to 60º F) nights. Since outdoor temperatures frequently exceed this range during the summer, select a site which has good air circulation and is "relatively" cool. A major problem with growing flowering cabbage and kale during the summer is excessive stem elongation due to high temperatures. To prevent stem elongation make a 1500 to 3000 ppm B-Nine application when the plants have developed true leaves and before stem elongation occurs. Several applications at the same rate may be made during July and August as needed. Do not apply B-Nine if the crop is going to be marketed as an edible crop. Maintain media pH between 5.8 - 6.5. Begin fertilizing at the rate of 50 to 100 pm N and K after seedlings emerge. Once transplanted, fertilize at the rate of 150 to 250 ppm N and K with periodic applications of a complete fertilizer such as 20-10-20. 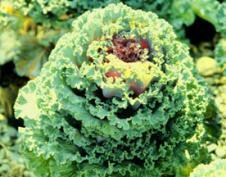 Slow-release fertilizer may also be used with flowering cabbage and kale. Keep the plants growing with adequate fertilization and moisture. Lack of N will cause the plants to turn yellow and lose lower leaves, a common problem in production. Maintain fertilization until night temperatures drop and coloration begins (September). At this time reduce fertilization to 50 ppm N and K. Excess N during this period will prevent good coloration. Plants require adequate spacing to encourage growth and prevent foliar diseases. Use 6" centers for 4" pots, 12" centers for 6" pots and 16"-18" incters for 8" mum pans. Use of drip irrigation or other automated waterin systems is recommended. Water stress will result in hardened growth and yellowing and dropping of lower leaves. The primary insects attacking flowering cabbage and kale include the cabbage looper, leaf roller, and aphids. Under excessive moisture and humid conditions young plants may be susceptible to downy mildew. For control of these insects and diseases consult the New England Greenhouse Pest Control Recommendations. Flowering cabbage and kale offer an attractive complement to garden mum sales during the fall. Since many early mum cultivars will have faded by late September, cabbage and kale offer the landscaper or retail customer a colorful replacement at a good value. With a pricing structure for the purchase of multiple plants, the consumer will get a good value while the grower obtains a reasonable profit. Promoting the plant as a colorful, unusual and long-lasting addition to the landscape will increase sales. Gilrein D. 2014. Getting Ahead of Pests on Ornamental Cabbage and Kale. Garrett Owen W. Garrett Owen and R. Lopez. 2014. Ornamental Cabbage and Kale Production Challenges. Purdue University. Yates R. 2012. Cabbage and Kale Culture. Griffin Greenhouse Supply Co.